Starring Asa Butterfield, Maisie Williams, Nina Dobrev, Tyler Hoechlin, David Koechner, Peyton List, Tituss Burgess, Sonya Walger, Margot Bingham, Ken Jeong, Briana Venskus, Ashlyn Alessi, Colin Moss, Ann Osmond, Francesca Noel, Billy Thomas Myott, Nicole Molinski, Ron Simons, Thomas Racek, Crystal Tweed and Sydney Veronica. Distributed by Shout! Studios. 96 minutes. Not Rated. There is nothing quite so tragic as a teenager who is dying. Which brings us to Then Came You, yet another film about a death-obsessed young man who learns how to live his life by really getting to know someone who is dying. It is better than some of the above films, worse than others, but watching it you kind of have to wonder who thought that this story really needed to be told. There is really nothing here you haven’t seen before, although it does have some fine acting by its young cast. 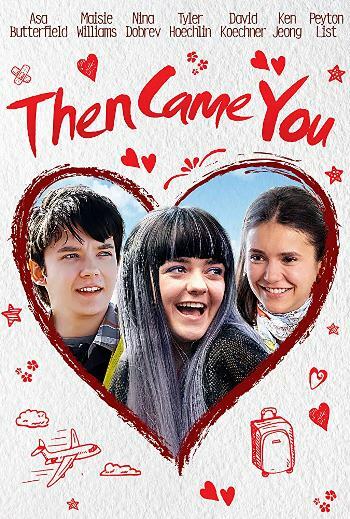 The non-dying star of Then Came You is Calvin (Asa Butterfield), an obsessive hypochondriac and depressive who lost his mother and twin sister when he was eight – of a cause that is left vague through most of the film. He now lives and works at the local airport with his father (David Koechner) and brother (Tyler Hoechlin). On his free time, Calvin mostly trolls Web MD and goes to doctors’ appointments and then argues with the doctors when they tell him that he is healthy. And he also is a surprisingly good self-taught artist (because, yeah, it’s one of those movies about misunderstood striving artists), carrying around a notebook with him everywhere making notations of his every possible symptom and stalkerishly hand-drawing a pretty flight attendant named Izzy (played by Nina Dobrev of The Vampire Diaries). When Calvin starts arguing the latest time that his doctor assures him that he does not have cancer, the doc suggests that he sit in on a cancer support group so that he can see how devastating the disease really is. While there he meets Skye (Maisie Williams of Game of Thrones), a fifteen-year old British girl who does have terminal cancer, and yet she is a fireball, a wild and wacky life force that will not surrender to the hopelessness of her plight. Instead, she wants to live life to its fullest, even if it means periodically breaking the law. She has made a “To Die” list – a more on-the-nose variation of a bucket list – of all the exciting things she wants to do before she dies. And she drafts Calvin to help her achieve these tasks. One of the problems is that Skye never really appears particularly sick through most of the movie, other than her series of bright multi-colored wigs – and even that could just be a cute affectation. Otherwise, she’s full of energy, relentlessly chipper, and never appears to be run down, sore or nauseous. She only really starts to look and act sick when the plot requires it towards the end. But, hey, at least Skye is willing to act as his wingman – helping him to timidly romance the slightly older (and totally out of his league) flight attendant Izzy, who seems to kinda like the morose little nerd. Of course, that may be because she mistakenly believes that he is dying too. And honestly, it’s just a bit creepy that he doesn’t come out and tell her that he really does not have cancer, though he tries at first. And that’s about it. They get to know each other better. They become good friends. She teaches him how to get out of his own head, have adventures and enjoy himself. She makes him a better man through her sacrifice. Some people – myself included – might think that Skye’s story was more interesting than Calvin’s. But, hey, her sickness helped get him out of his funk, right? If that’s the story you’re looking for, Then Came You tells it fairly well. Tags: Ann Osmond, Asa Butterfield, Ashlyn Alessi, Billy Thomas Myott, Briana Venskus, bucket list, cancer, Colin Moss, Crystal Tweed, david koechner, Death, Fergal Rock, Francesca Noel, Jay S. Jacobs, Ken Jeong, Maisie Williams, Margot Bingham, movie review, Nicole Molinski, Nina Dobrev, Peter Hutchings, Peyton List, PopEntertainment.com, Ron Simons, Sonya Walger, Sydney Veronica, tearjerker, Then Came You, Thomas Racek, Tituss Burgess, Tyler Hoechlin. Bookmark the permalink.